Even though the Nomad is not in the garage it still looks like a bomb has gone off in there and it was time to do something about it. Over the last six months I have accumulated a pile of spare parts for it as I noticed the US suppliers all managed to put their prices up on a regular basis and I had to purchase them, so it may as well be sooner rather than later. We also had a favourable exchange rate going and I managed to get them all before the rate tanked. Chalk that up to luck rather than good management. The garage could be summed up in two parts – all the new stuff and all the crap that came with the car or came off the car. The new stuff was boxed. The other stuff was loose and added to the overall appearance as mentioned earlier. With the Nomad now getting the driveline fitted a number of the new parts left for Quickfit Motorsport which made a slight improvement in the overall appearance of the garage, but not by much. 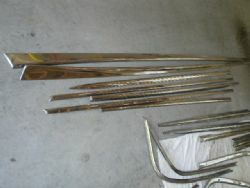 The lead time to get the mouldings repaired and polished is a few months and given they were all loose and piled all over the work bench I figured it may be opportune to get them out of there as well. 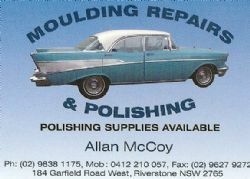 When I spoke to Allan McCoy of Moulding Repairs and Polishing he mentioned I could save a few bucks if I cleaned the mouldings myself. I watched his daughter Donna do it and with the squiggly steel wool and figured I could do that. I was right, but I didn’t realise how many hard yards were required and the impact it would have on my hands. Blind Freddy could see how you could save money as it took me the equivalent of three days to clean all the mouldings thoroughly. It was a little like painting a room – you don’t necessarily like it but when it was finished there was a certain satisfaction in knowing you did it well and they looked good. A lot of the mouldings were glued, and even after fifty one years the glue is stuck all over the mouldings and still soft, sticky and a hassle to remove. No short cuts here, just hard yards. With the preparation done it will allow Allan and his team to get stuck into them. They were very appreciative of me for cleaning them as very few customers do. 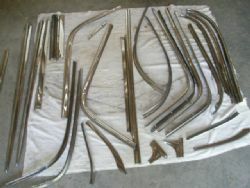 The artisans at Moulding Repairs and Polishing can fix just about anything made of alloy. Some mouldings can be tricky and because they are notoriously thin if there are major dents they may not be able to be repaired to perfection. 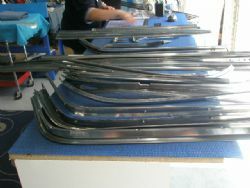 With the thirty five mouldings I dropped off the two lower windscreen mouldings had taken numerous hits over the years from the windscreen wipers and I was advised these would not appear flawless.